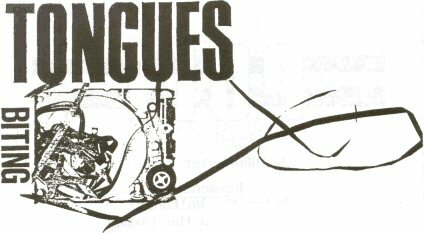 Debris, Issue 10 - 1986, "Biting Tongues "
"An excellent 12" EP from those eager Mancunian Bohemians, fresh from the 'Feverhouse' film. 'Trouble Hand' is a kind of industrialised Defunkt,pushed along by a bass riff that almost always threatens to launch into overdrive,but holds itself back and builds a steady core of repetitive sound. Round this rhythmic core,in a jazz-like structure,grows a further complicated anti-rythmic sound;scrambled brass (with a phrasing that almost talks) and the kind of vocals - flat and enigmatic - that you associate with the Throbbing Gristle school of vocalising. Far more up-tempo than the 'Feverhouse' soundtrack LP, this brings joy to your feet and damn well wins you over." There's nothing wrong with that review, except it could have pointed out that the four tracks on the b-side are all fine songs in their own right. The short 'Probate' is built on spoken words, the others are hectic sounds based on rushing horn rhythms. Mentioning Defunkt and Throbbing Gristle is a useful grasp in the dark, but as the drummer Phil Kirby pointed out when I met three of them recently, "You've no reference points to what we do if you've only listened to Western rock music". This is not to say that their music is inaccessible to the likes of you and I; recent sets at Corbieres have been attended by a large and wide cross-section of music fans. Biting Tongues formed in order to perform a live sound-track to an 8mm film of the same name at the Factory in 1979. Of the 6 or 7 in the band on that day, only Graham Massey and Howard Walmesley remain. Although they are keen to convince me that they're not famous, their records do sell well in foreign lands;Japan, Holland and (in the case of earlier works) Scandinavia and Italy. They don't. have a ready-made market or audience. But despite this, and despite the near impossibility of the search for genuine reference points, they do share, in the degree of unorthodoxy at least, common ground with the likes of 23 Skidoo. And Graham admits that "bands like ACR aren't that far from many of the things we do". It's for certain that they are, in Howard's words "horribly alienated" from the mainstream popular music world. Graham is responsible,apparently,for the guitar, trumpet,trombone,tepes, clarinet and vocals; a surprisingly vast armoury for such an unassuming (& likeable) man. Their work on soundtracks has culminated recently in the 'Feverhouse' soundtrack. 'Feverhouse' (released by Factory Ikon, scripted by Ken Hollings) was directed by Howard Walmesley, with others in the band being involved in more than the soundtrack. Making a soundtrack to a film is a complex business, but Graham explained that in their wider involvement they "absorbed what the film was about and its atmosphere", and the making of the soundtrack was, in a way therefore, "second nature". They spent a month recording the soundtrack in an E.T factory in Reddich; they swear "there were E.T skins lying everywhere.In this bizarre environment they weaved together the oddest sounds; they used "sticks, stones, bones, and its of metal" as more conventional instruments. Graham considers the 'Feverhouse' soundtrack "an anomaly in our discography - not like any of our other records and not like the things we do live". Howard, one of Manchester's most prolific independent film-makers, says that out of all his activities "music has the highest priority, though it's not the one I can give most time to". Perhaps because of their immersion in visual, cinematic ways of thinking, their music tends towards evocative sound, textures and tones. If you think about it, jazz - out, of all modern styles of music - has always made for the most colourful and persuasive film scores. Words take a back seat in their music; they're not concerned with delivering messages along quite such a well-worn path. One of the differences between film and music for Howard is that one of his films, once released, is a "fixed thing, something permanent that can't be changed", but music, through recurrent performance is "much more fluid". This is especially true when musicians have the same kind of allegiance to jazz as Biting Tongues have; an allegiance which recognises how jazz has a reputation for staidness, yet which realises that jazz forms and unleashed horns can produce the most soul-stirring sounds. Their sound, lively and celebratory, yet on the very borders of convention flows with great ease. Playing loud and live the sparks can really fly. "One of the things that have changed",says Howard "is that people used to think we wanted to sound like someone else,and failed. Now they like us, and take us on our own terms. It's hard to call the music 'unconventional' because it seems totally reasonable to me".